← For the love of grandmas, wet glue & hard candy. and now, sad to say, they’ve held all the love they can take without leaking a little, lol. As you can see, we have a bit of a problem. 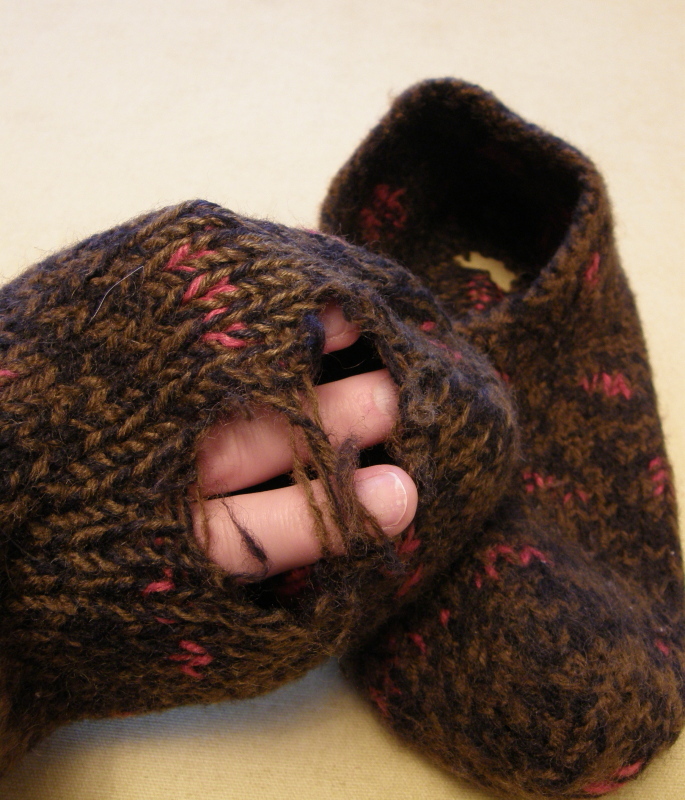 and a terrible toe hole! My hubby has been cajoling and yes, whining just a bit lately, because I have been promising to do something to fix these babies, and just haven’t gotten around to it in a very timely manner… so sorry Sweetie! I eventually had to hide them, because he just kept wearing the daylights out of them and I knew if I didn’t act quick, there wouldn’t be anything left to fix, lol! Well… finally I had the chance to do something about it. I figured that I could make a new sole for them… an extra thick felted version that would not only fix the holes, but would add extra cushy-ness as well as long lasting durability! 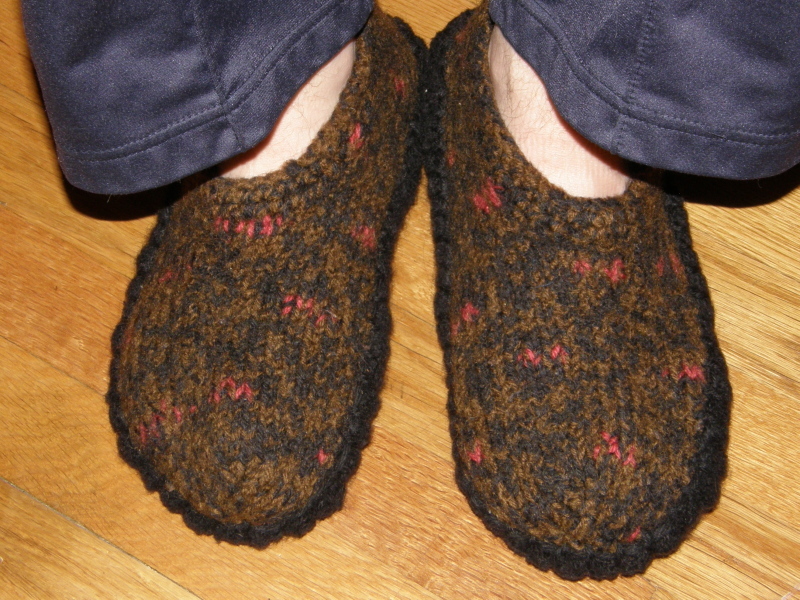 What I did was create these things in double knit on the long yellow Knifty Knitter loom. *NOTE: You must use 100% Felting Wool in order to be able to transform these things into thick, durable pads. 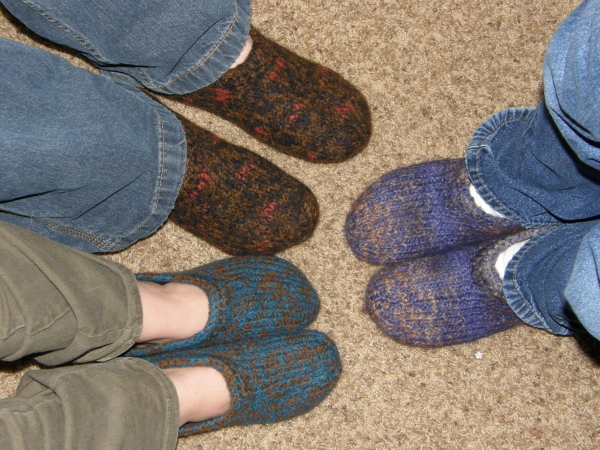 I then knit one row in Double Stockinette. I did this until I had 18 peg pairs filled. 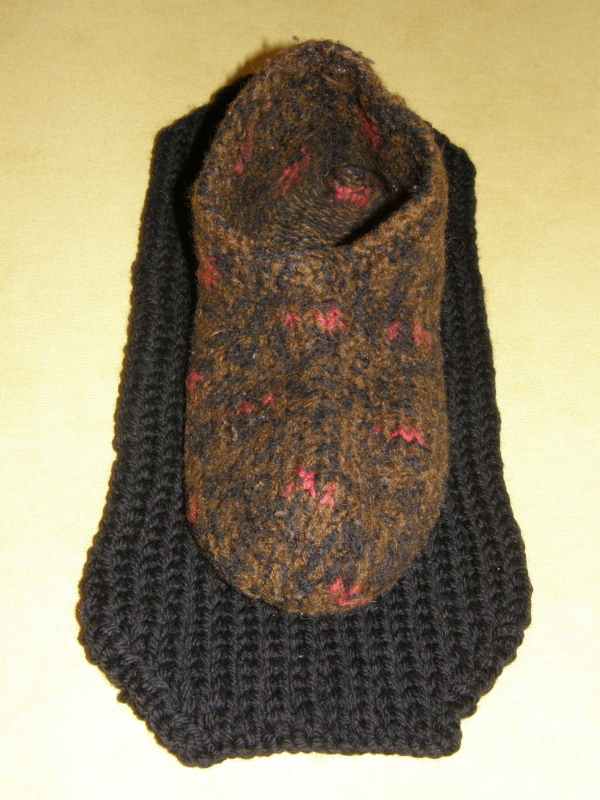 I then proceeded to knit in Double Stockinette until my piece measured 13.5″ (1.5″ short of the total I needed, which was 15″) . Then I decreased one peg pair each row, alternating ends each time, just as the increases were made, until I was back to 10 peg pairs. 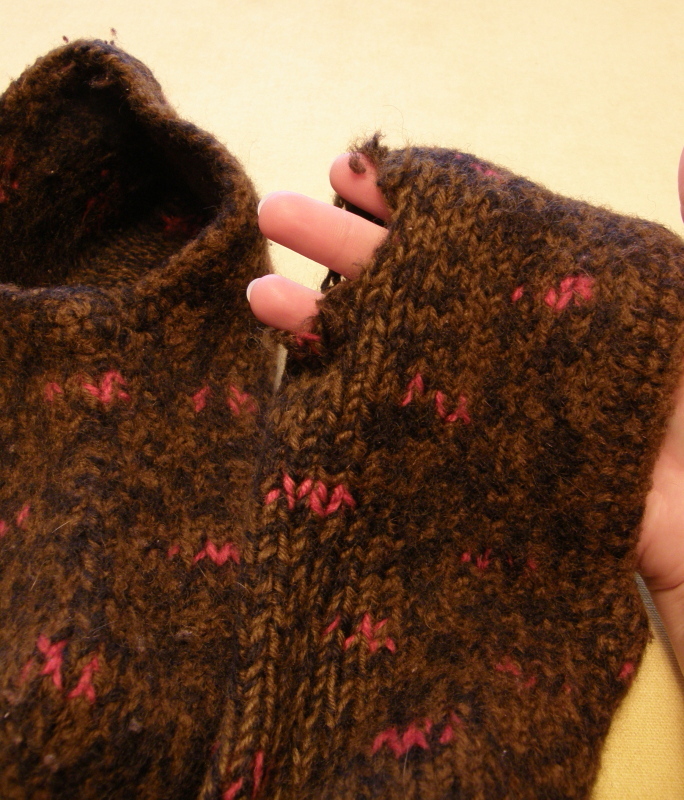 I bound off each stitch in line using the Basic Bind Off. 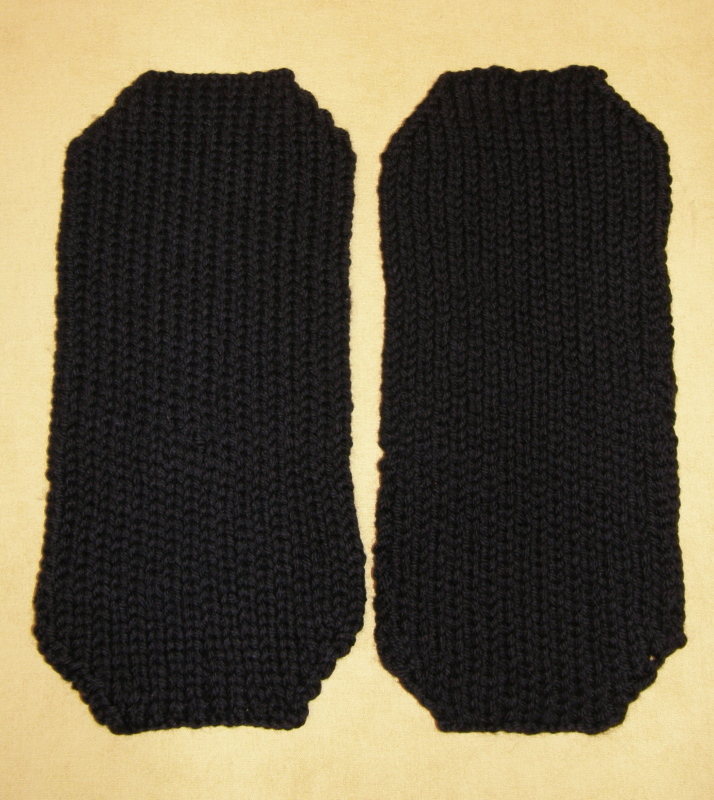 **See the photos at the left to compare the amount of shrinkage you can expect from the original knitted pads. I threw mine into the washing machine on HOT cycle, with 2 tablespoons of laundry soap and 2 pairs of jeans for agitation. I ended up having to repeat the cycle before the water drained from the washer 2 times, for a total of about 30 minutes agitation. Then I just let the washer finish the washing cycle. 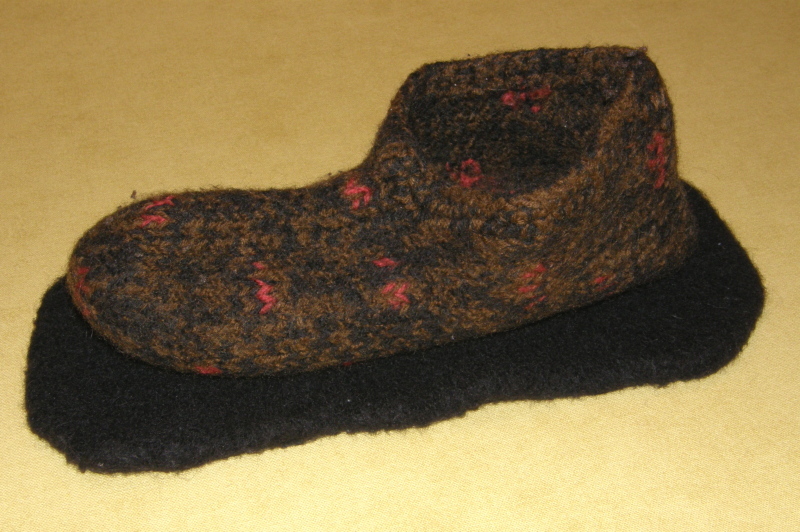 All washers and different types of wool will tend to felt a little differently, so make sure to watch your wool items very carefully as they felt…just continue, or stop, the process until you feel that your soles are the right size and have been sufficiently melded together into a tight, thick pad. Now it’s time to fit them to your slippers! 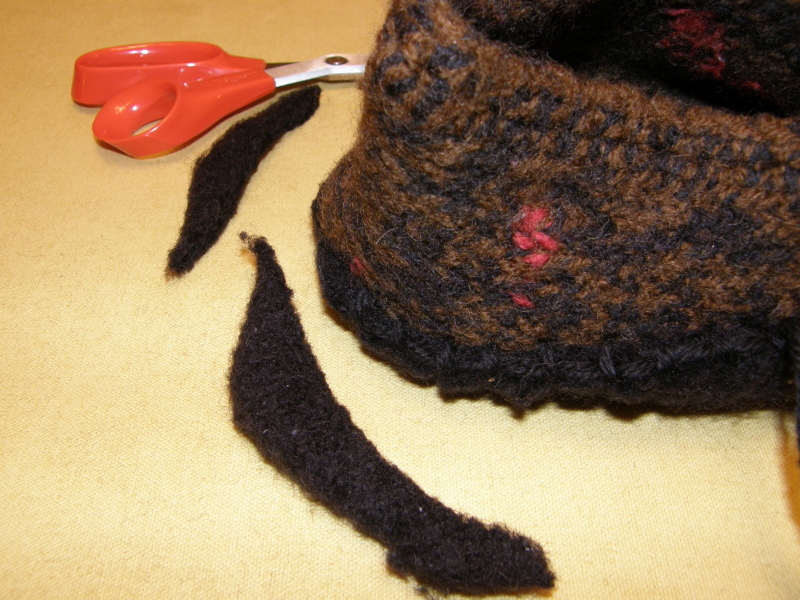 You may trim as the picture above is detailing, both for a more rounded edge and for a better fit all around. Don’t worry! If you have felted these babies enough that you can’t see the stitches anymore, those fibers are so tangled together, it won’t matter one bit to trim into them. 😉 Just make sure to leave enough around the edges to be able to have the soles come up just a bit around the slipper. Next it’s time to secure your new soles in place. 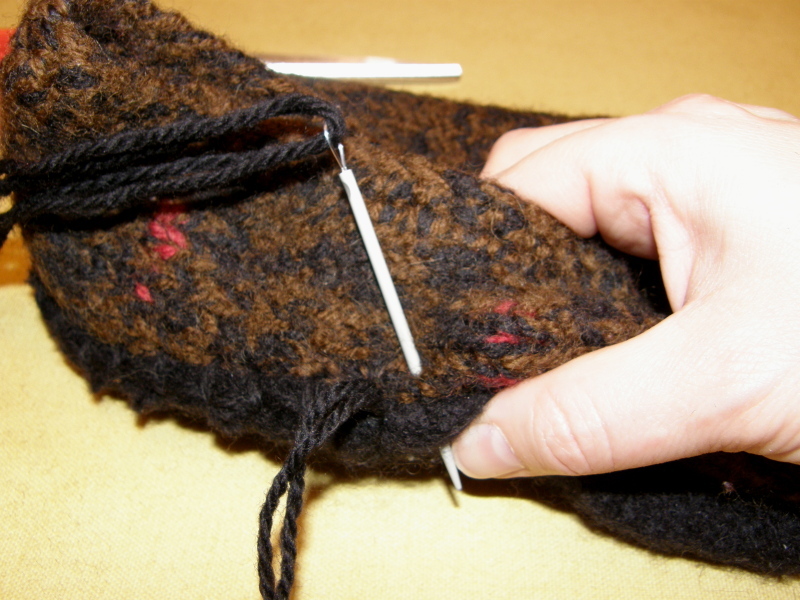 After pinning, I securely blanket stitched mine in place, using 2 strands of the same wool yarn and a very sturdy needle. 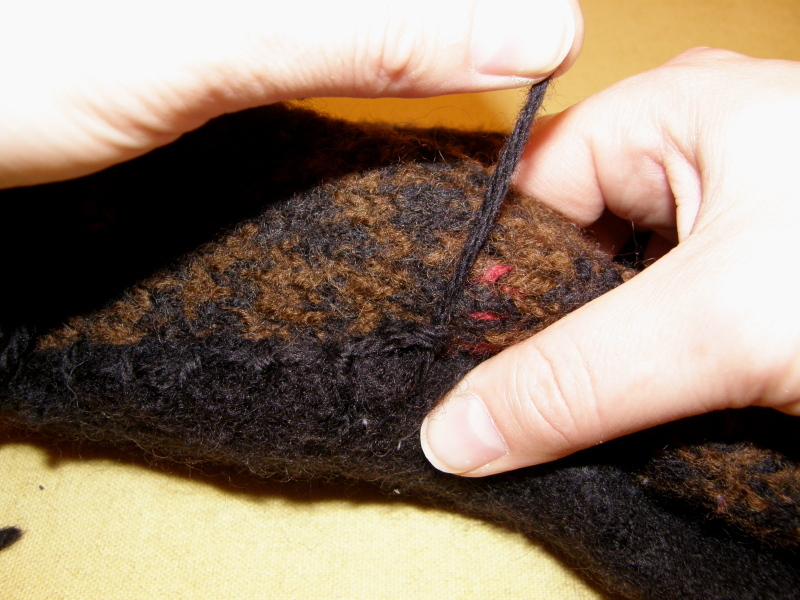 Then just pull the stitch snug to the sole and slipper. 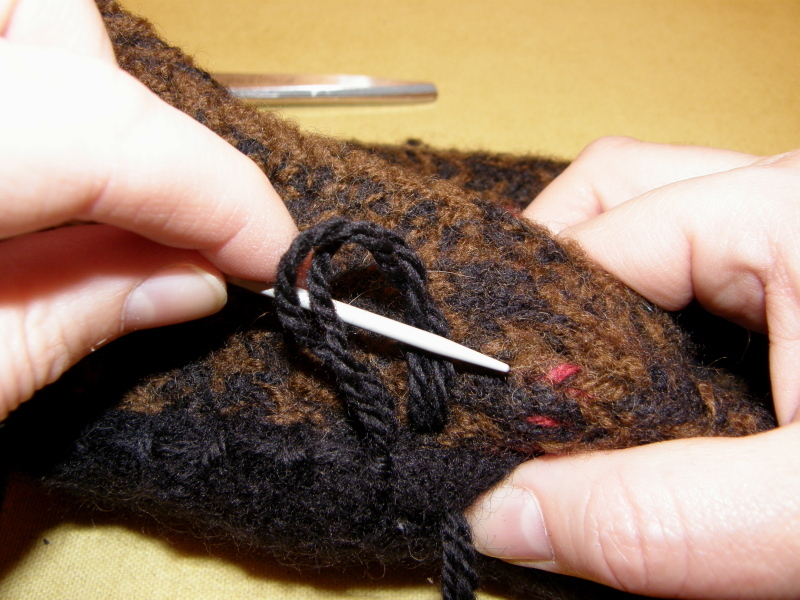 (*see pic) Continue all around the sole until it is securely stitched in place! 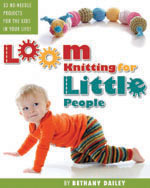 This entry was posted in Knitting, Loom Knitting, Looming Patterns, Tutorials. Bookmark the permalink. 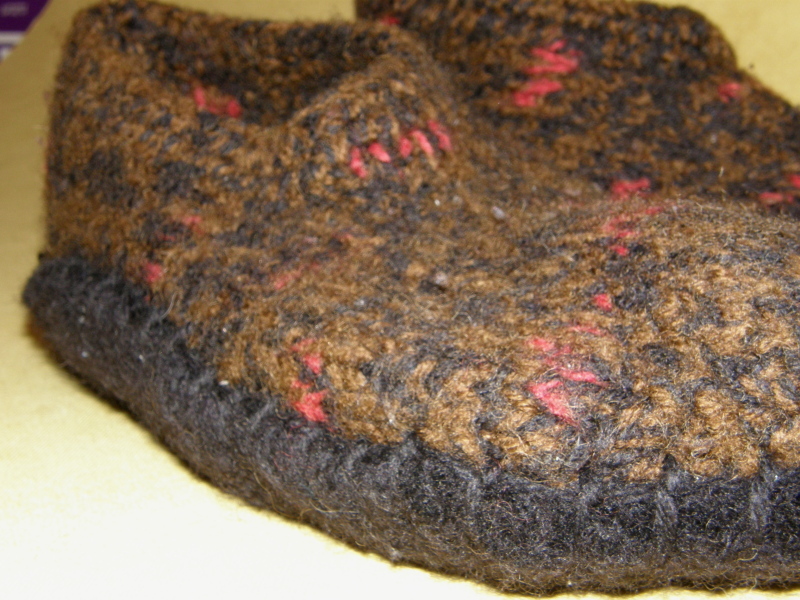 6 Responses to Felted Slippers Facelift! Love it!!! 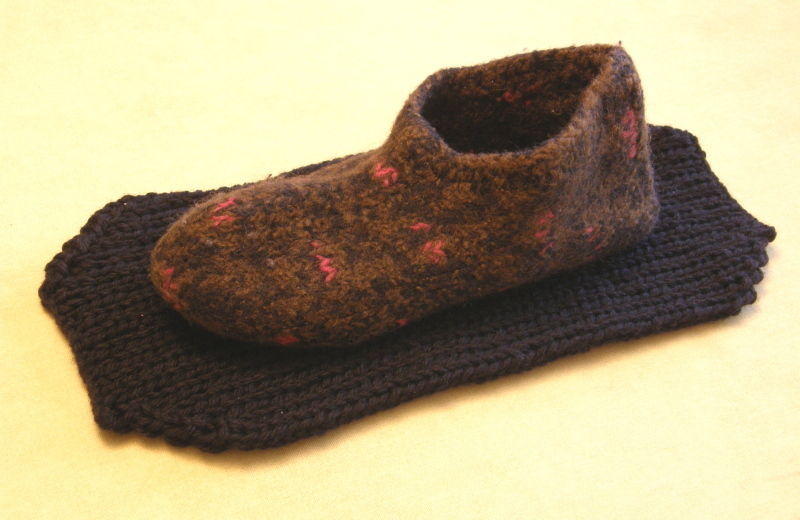 This is an awesome idea for both old and new slippers. Thank you, Bethany! Just love it! Your site continues to amaze and delight me! And the doubleknit soles? LOL! 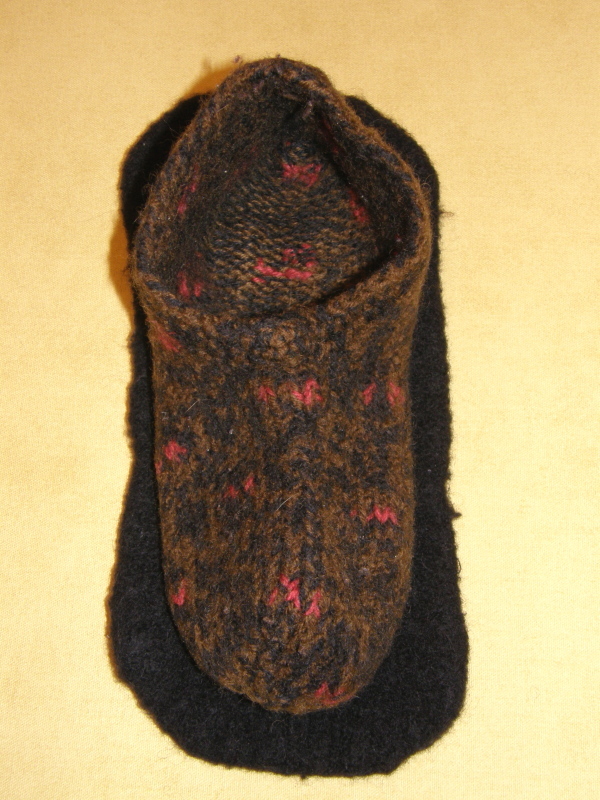 I have used the “left-over” felted pieces of material to make: coasters, decorations on other items, “stuff” some of my loom-knitted toys, and even made a Rocky the Squirrel hat from a toe part!